Kids' gardening starts with radishes. The seeds are cheap, easy and fun to grow. Harvest is fast, too - usually less than a month after planting the seeds. You can start radish seeds outside any time in April or May, and they'll turn out great. They don't like the really hot weather so much, but you can start new seeds in August or even mid-September and you're likely to get a delicious fall crop as well, and beat the frost. Keep them moist, write down the expected harvest date in your garden calendar (use the seed packet instructions), and watch your radish patch carefully for telltale glimpses of red when it's close to harvest time. You'll be rewarded with this tasty, nutrient-packed little veggie. when she pulled up these radishes from the soil! 1. Radish roots may grow 6 or 8 inches deep, even though the radish itself rests near the surface. So it's a great idea to dig a foot deep and loosen up the soil really well, adding compost or rotted manure to enrich it. 2. 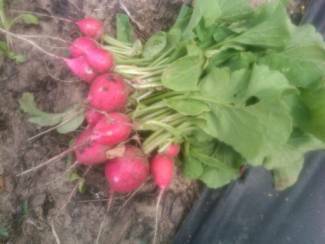 Radishes are great to plant next to beans, carrots, cucumbers, lettuce, peas and squash. They act as "soldier" crops that attract harmful bugs first, before they can get to those other crops. Then you can either dispose of the harmful bugs, or throw away infested radish plants, since they are very cheap compared to the plants the radishes are protecting. 3. Since you can plant radishes very early in the spring and they're ready to be harvested right when summer growers are ready to be planted, they make great use of space by double-planting. 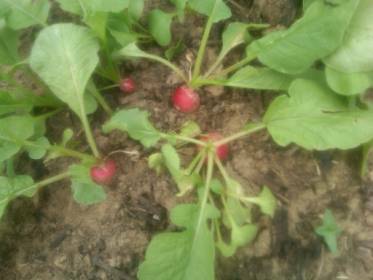 Once you harvest the radishes, you can immediately re-use the same soil by planting beans. Then when the beans are almost done bearing in the late summer, plant radish seeds again! By the time you're throwing away the dead bean stalks, the radishes will be growing and using that space again. 4. Since radish seeds are so tiny, you might want to mix them with a cup of sand so that you can pour out a row of the sand-seed mixture and expect the seeds not to get too clumped together, or blow away from your hand. 5. Use your stiff garden rake to rake the prepared seedbed in a straight line and make shallow canals, or furrows. Then you can follow the line that the tines of the rake - the sharp points - make as furrows to pour out your sand-seed mixture. Or use a ruler or a yardstick to make straight lines. 6. Pour out radish seeds in rows that are 3" to 6" apart. 7. With your hands, brush about ¼" very fine soil over the radish seeds. 8. With a sprinkling can or misting hose attachment, keep the soil moist with a daily sprinkle every day 'til the little green tops peek up. Don't allow standing water, and don't let it be soggy - just moist about an inch down, to encourage the plant to root and sprout. Water needs after sprouting relax a bit; then you can sprinkle every other day or so. 9. When radishes are about 2" tall, you might need to remove some of the baby plants. Thin by pulling extra ones out, or even by cutting them off at the soil line with small scissors, so that you don't disturb the other radishes. Shoot for ending up with radishes all standing about 2" away from any other radish. Yes, you're wasting seedlings by thinning, but it's better to ensure each radish enough space, and seeds are cheap! Ready to be pulled up.